Chicago Agent magazine released the numbers and ranks the top 20 agents and brokerage offices in Chicagoland’s six counties in its Real Data online issue. 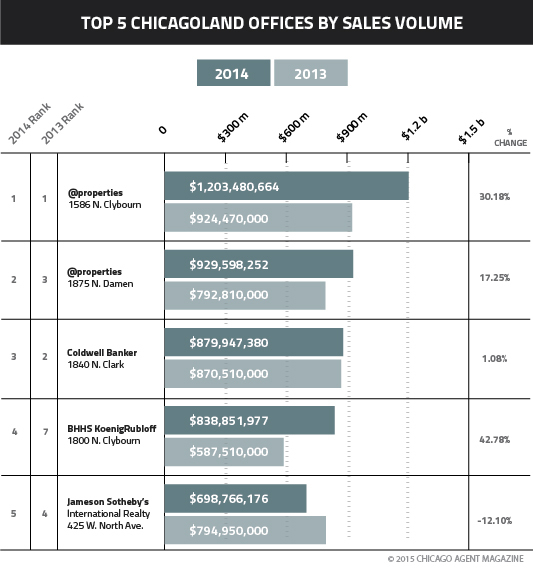 Chicagoland’s top five residential real estate offices closed over $4,550,000,000 in 2014, showing an increase of more than 14% over 2013. 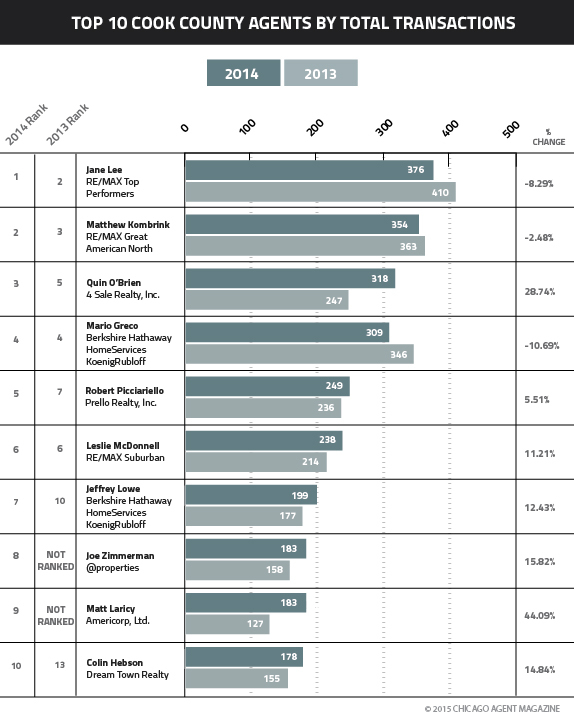 @properties offices led the brokerages once again with offices in the number one and two positions, both showing significant gains from 2013 while Coldwell Banker Lincoln Park was third with modest gains over last year. The merging of offices for Koenig/Rubloff, now called Berkshire Hathaway HomeServices KoenigRubloff Realty Group, gave them a gain of over 42% moving into the fourth spot. Ranking fith is Jameson/Sotheby’s with transactions totals nearing $700,000,000, down 12% from 2013. The top five agents also showed an impressive 21% increase in total sales from 2013 to 2014. Jeff Lowe of Berkshire Hathaway HomeServices KoenigRubloff Realty Group leading was the No. 1 agent in 2014, with over $187,000,000 in sales, a 35% gain from 2013. Real Data showed seven agents that posted more than $100,000,000 in sales in 2014 including Jennifer Ames, Mario Greco, Dawn McKenna, Jane Lee, Emily Sachs Wong and Chezi Rafaeli. Other newcomers to the list were Matt Laricy, who ranked 18th in Chicagoland, ninth in Cook County, Alice Chin , who ranked No. 7 in DuPage County and Erin Bendis who ranked No. 6 in McHenry County. Laricy attributed his entrance in the top 20 and top 10 lists to taking on more transactions – 183 in 2014 compared to 127 in 2013. Chezi Rafaeli, who was not in Real Data 2013’s top 20 agents but was the No. 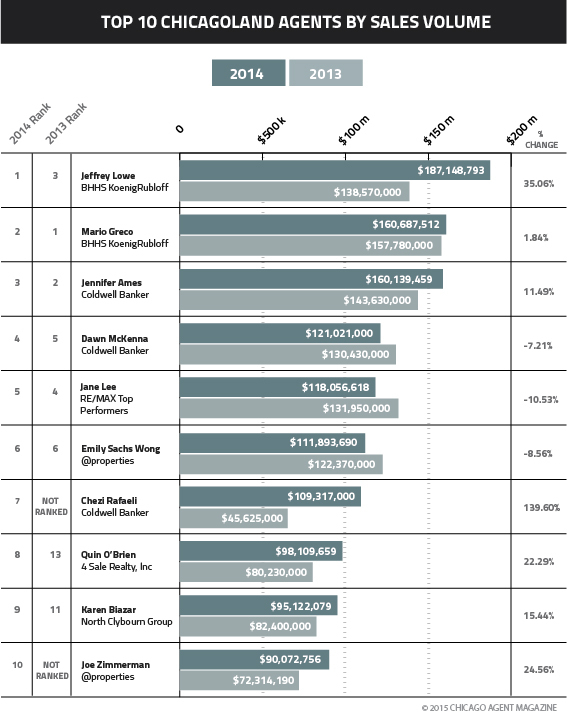 7 agent in Cook County by volume in 2014 with a 139.6 percent increase in sales, added that the economy helped him improve his numbers substantially. The amount of transactions per the top agents didn’t necessarily increase in 2014, as well. Given the total sales volume across all six counties is $28,371,144,620 and the total transactions is 104,500, the top 20 agents in Chicagoland’s total sales volume accounts for 7 percent of those sales. The top 20 agents in Chicagoland also accounted for 3.4 percent of all transactions. Though home prices were up in 2014, total sales were down across the board according to the National Association of Realtors. Therefore, offices had a balancing act of home prices and sales, and increases in volume meant home prices had increased enough to offset a lower sales volume. Each county experienced its own increases – and decreases – in total sales volume in terms of top office volume. Cook County had a 6% increase in its top offices’ total sales, while DuPage County’s top sales decreased by 4.9%, and Kane County’s top office volume decreased 10% from 2013. Real Data reports the top 20 agents and brokerages for Cook, DuPage, Kane, Lake, Mchenry and Will counties. All rankings include buy and sell side figures, including number of transactions and dollars closed. Also noted are the stats for the top sales for each county. Real Data includes information gathered from January 2014 through December 2014. All information was obtained, analyzed and provided by LeapRE-Chicago’s Real Estate Data Experts. To see the full Real Data report, click here.